I'm so sure this looks very familiar. Oh well,sometimes you have to admit you made a mistake and move on. Because the truth is,in your heart you know what you are doing isn't right,you know when you have goofed...but there is that thing, I don't know if its fear,guilt or pride,that holds you in the dysfunction. Remember you are not God, you are not perfect either. Its allowed. Who cares what people think? Will you rather live in frustration just to save face? Ko make sense [it does not make sense], Ko le werk [it can't work]. I'm not excusing bad decisions,and I strongly believe we should train ourselves to hear and heed the voice of the Holy Spirit. 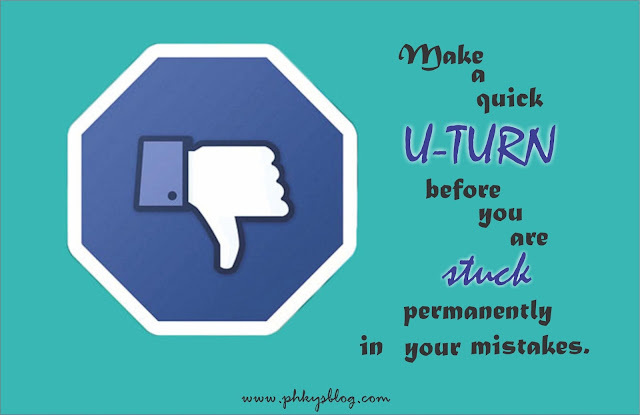 But when you have made a mistake,its wise to make a quick U-turn before you are stuck permanently.